bl.uk > Online Gallery Home	> Online exhibitions	> Asia, Pacific and Africa Collections	> Bai Motlibai Hospital, [Bombay]. 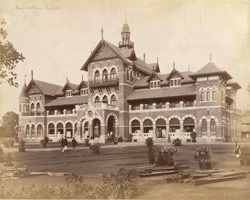 Photograph of Bai Motlibai Hospital in Bombay from the 'Album of architectural and topographical views, mostly in South Asia' taken by an unknown photographer in the 1890s. Bombay, the capital of Maharashtra, is one of India's major industrial centres. In 1661, the area came under English control as part of the dowry brought to Charles II by the Portuguese princess Catherine of Braganza. In the 19th century, Bombay became a prosperous centre for maritime trade. As the population grew, improved medical facities were required in the city. The two most important medical structures built at this time are St George's Hospital and the Jamsetjee Jeejeebhoy Hospital.